Home › Allgemein › Our new website is online! We are always looking to improve our service for our partners, which is why we decided that it was the perfect time to spruce up our website! Navigation and content have been expanded and developed, the design has been adjusted, and new banners have been created. You can find all the important information about bet-at-home.com and bet-at-home.com Affiliates, earning potential, advertising material, and the most commonly used terms here. 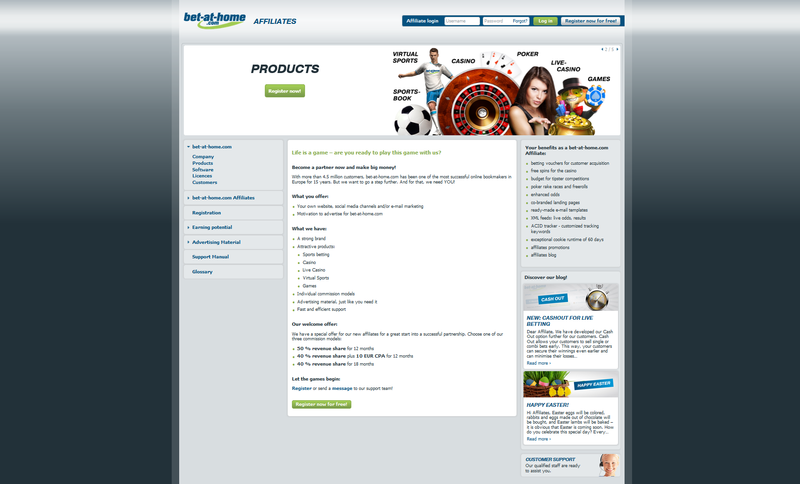 Have you already checked out our bet-at-home.com Affiliates blog at https://blog-affiliates.bet-at-home.com? You can find all the latest news about our Affiliate Programme and bet-at-home.com here. Simply subscribe to our blog to keep up with the latest promotions and offers, changes, exciting news, and much more. Both of the most recent articles can also be found on our website now. We look forward to welcoming you to our website and blog, and, of course, to receiving any feedback you may have! If you have any questions or need assistance, simply send an e-mail to affiliate.en@bet-at-home.com and our committed support team will help you immediately. Da wir immer sehr bemüht sind, das Service für unsere Partner stetig zu verbessern, war es nun an der Zeit, unserer Website einen neuen Glanz zu verleihen. Die Navigation sowie die Inhalte wurden erweitert und vertieft, das Design angepasst, sowie neue Banner erstellt. Ihr findet hier alle wichtigen Informationen über bet-at-home.com und bet-at-home.com Affiliates, Verdienstmöglichkeiten, Werbematerialien, sowie die am häufigsten verwendeten Begriffe. Kennt ihr schon unseren bet-at-home.com Affiliates Blog: https://blog-affiliates.bet-at-home.com? Hier findet ihr immer die neuesten News rund um unser Affiliates Programm sowie über bet-at-home.com. Meldet euch einfach für unseren Blog an, um immer auf dem Laufenden über neue Aktionen, Promotions, Änderungen, spannende News, etc. zu bleiben. Die beiden aktuellsten Beiträge sind ab sofort immer auf unserer Website zu finden. Wir freuen uns über euren Besuch auf unserer neuen Website, sowie auf unserem Blog und natürlich über Feedback jeder Art!